Walk and Roll to School Day! Three times every month is Walk & Roll Day, our celebration of walking, biking, transit, and carpooling! We think it's really important to get students out of single-family vehicles because kids that get some exercise before starting the school day are better able to focus and learn than those that arrive by car. All kids will get a chain for collecting brag tags on their back-pack. Three times a month, announced a few days in advance, parents will be out to catch students walking, biking, taking transit, or carpooling. One of those times, students receive collectible brag tags, which they can display proudly on their back pack. Teachers will tally kids with punched cards when they get to school, and the class with the most green commuters will win the coveted Golden Sneaker for the month. WHERE DO WE PARK BIKES & SCOOTERS? Label your scooter and bring it to the scooter rack just inside the double doors that lead to the main yard. Bring a lock for your bike so you can secure it to the bike racks on Lippard St. and in the recycling area next to the pedestrian bridge. Students that take the bus or drive to school can still get their card punched if they are dropped off at the parking lot across Bosworth St. from the school. We have crossing guards to safely guide kids across the street in case parents can't stay for clap-in. We are looking for parents to spend three days during one month only to help distribute brag tags and other prizes. 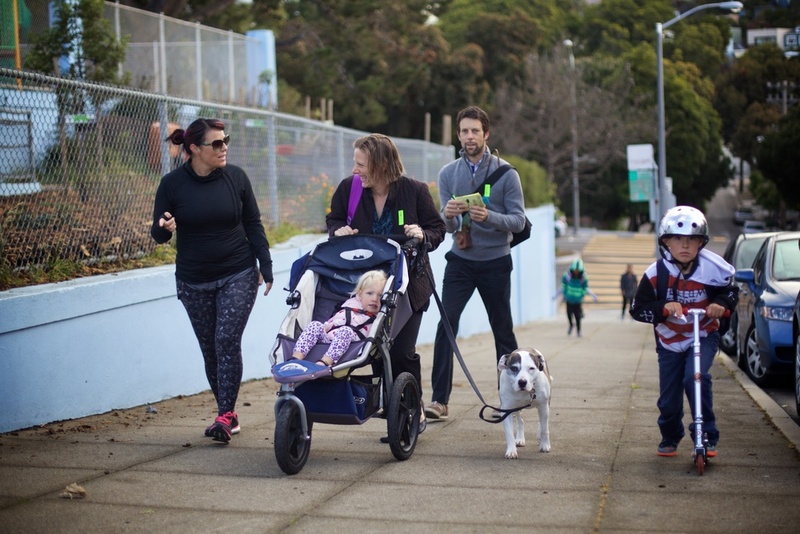 If you can help, email Nik Kaestner at walkandroll@glenparkschool.org or call/text 415-646-6137.